Year/decade of opening- 1910 approx. he guy in the shop did not know the exact year. On the signboard it mentioned 100 years. 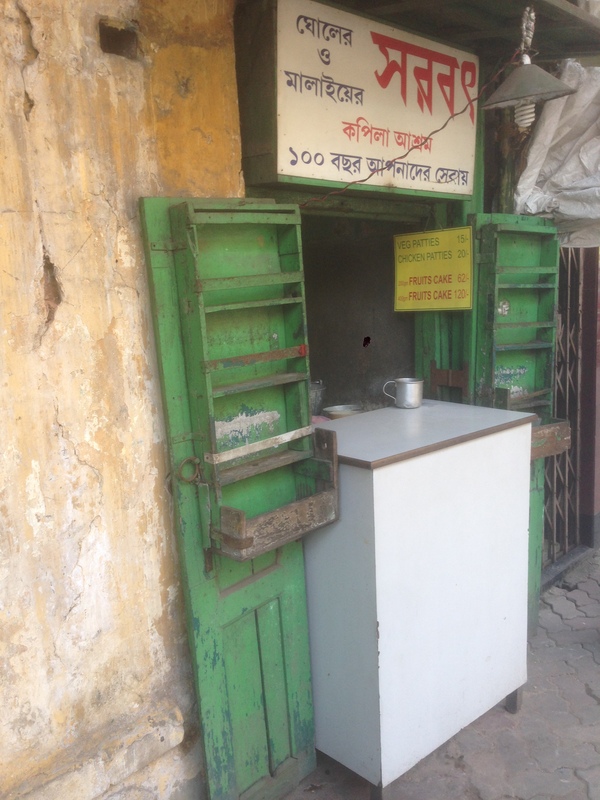 Legendary 100 year old Kolkata sharbat shop that still serves some unique hand churned sherbets. YUMMRAJ says for Kapila Ashram – ‘OLD IS GOLD’. This shop is located in an approx 100 yr old building that once housed what it seems, a decent hotel. It is located in a place called Simla (yes, Simla in Kolkata) – same locality where Swami Vivekananda was born & he grew up. The hotel is in ruins now & I cud see nothing but debris inside. 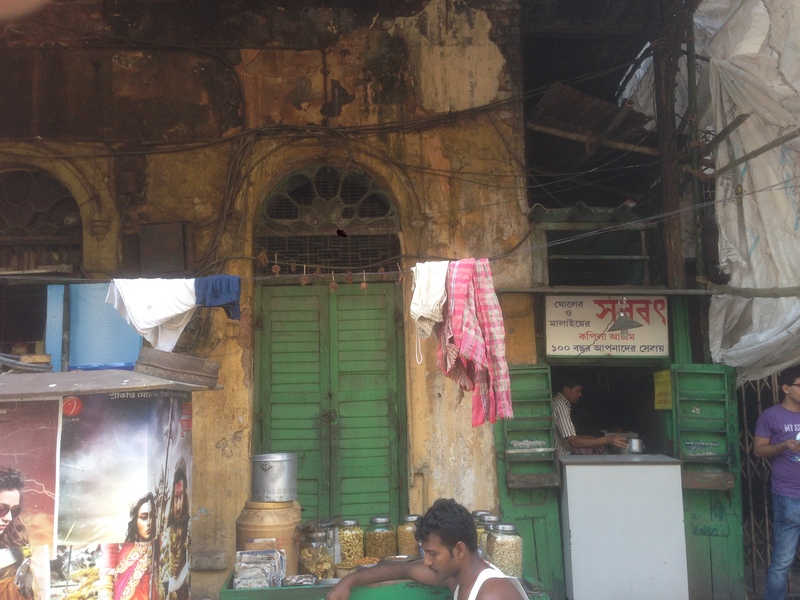 The covered walkway of the house has 2 shops – a poorly stocked daily needs shop & the sharbat shop. 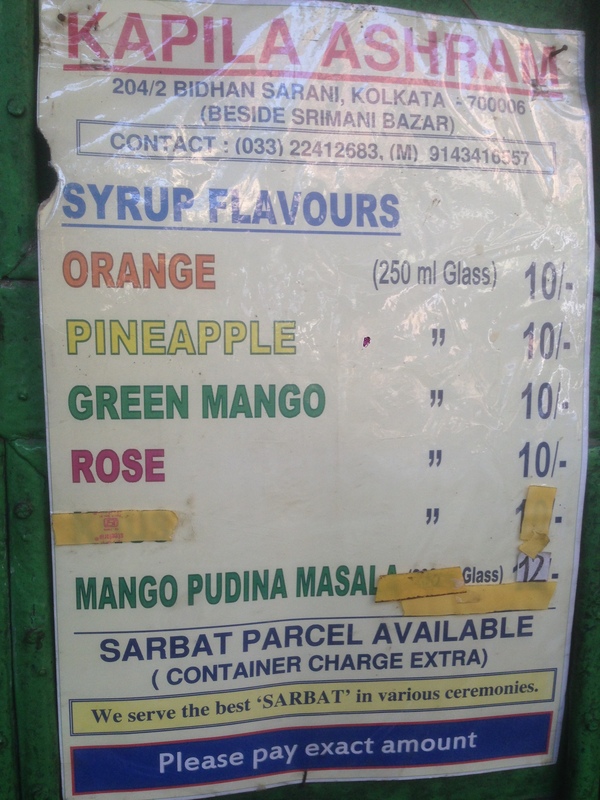 The sharbat shop has two parts – one serves hand churned dahi based drinks & the other serves syrup & water based drinks. Both the shops r manned by one person each. So if one of them go for a bio break, they close the shutter & go. 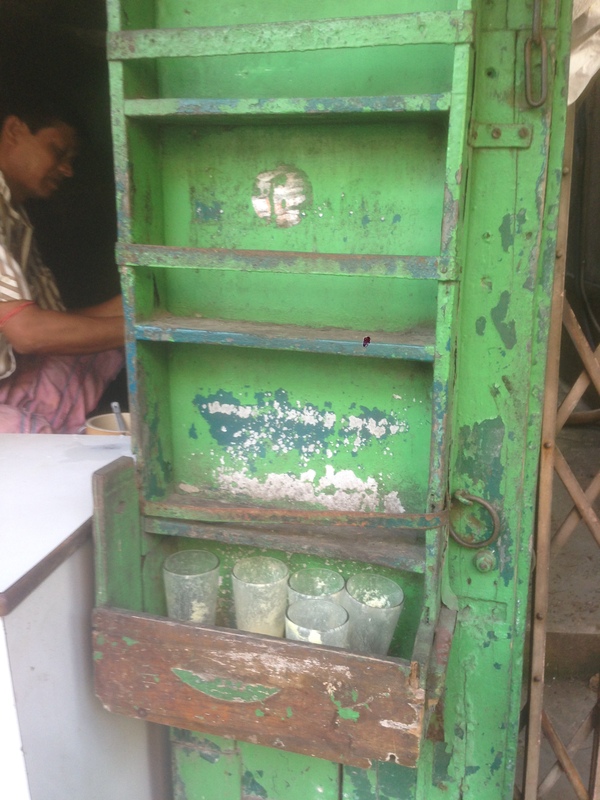 This shop that serves the dahi based drink is physically a ‘hole in the wall’. The customers cannot enter the shop. They have to take sharbats standing on the footpath (which is covered on the top). The shop is on a 2.5 ft slab & the guy sits atop it. 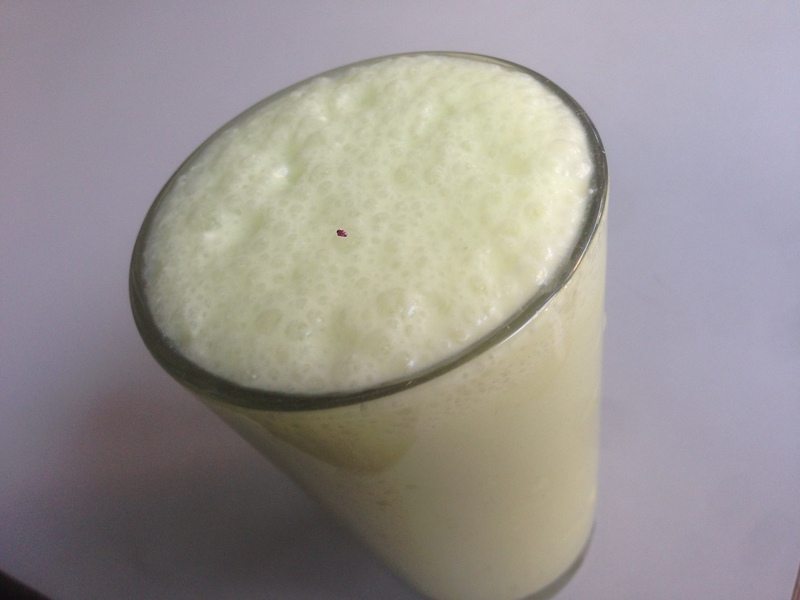 They serve 3 kinds of drink – kesar malai, rose malai & Abar Khai (meaning ‘I want to have it again’). The way the measurements r, the guy has to make 6 glasses at a time. So if 3 people go & ask for different drink, the guy says ‘ sorry, pls choose 1 drink – will serve it to all 3’. 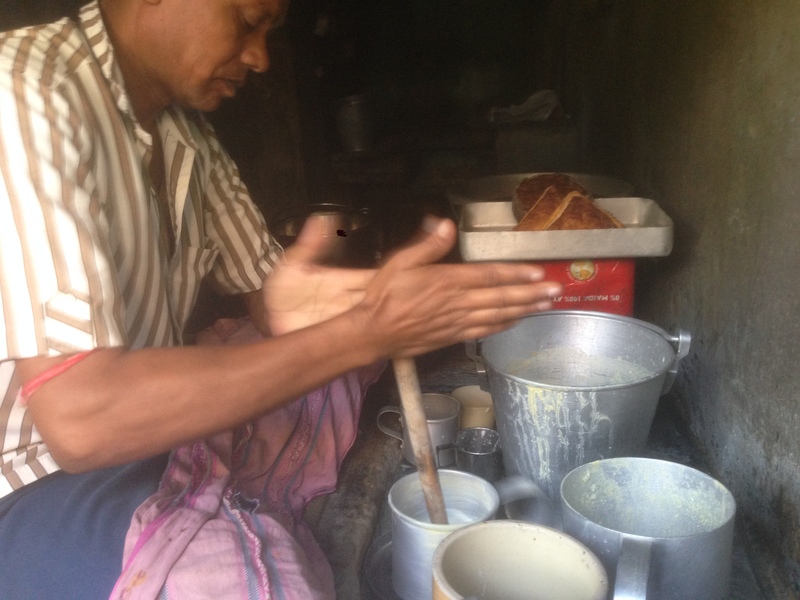 The Curd that they use r made by them – do not buy from market. So the curd has a Slight fermented feel, like curd made at home. 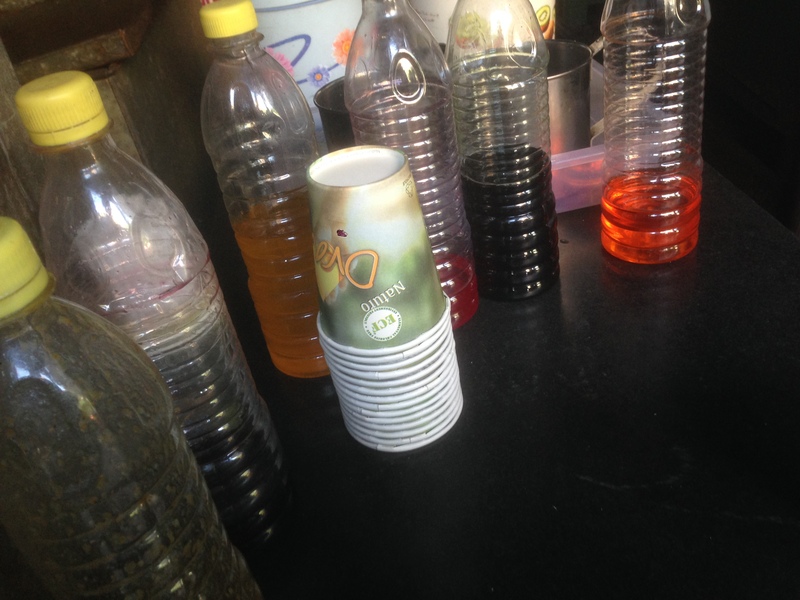 The syrups r made from fruits by these people & then mixed with water or soda b4 serving. They had about 10 types of sharbats in this section. 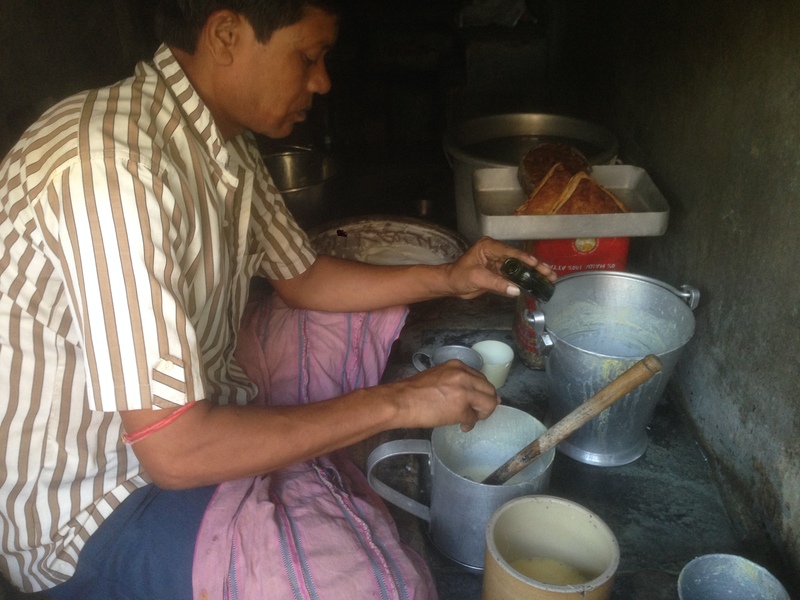 We started with Kesar malai – a curd based, hand churned, water added drink. 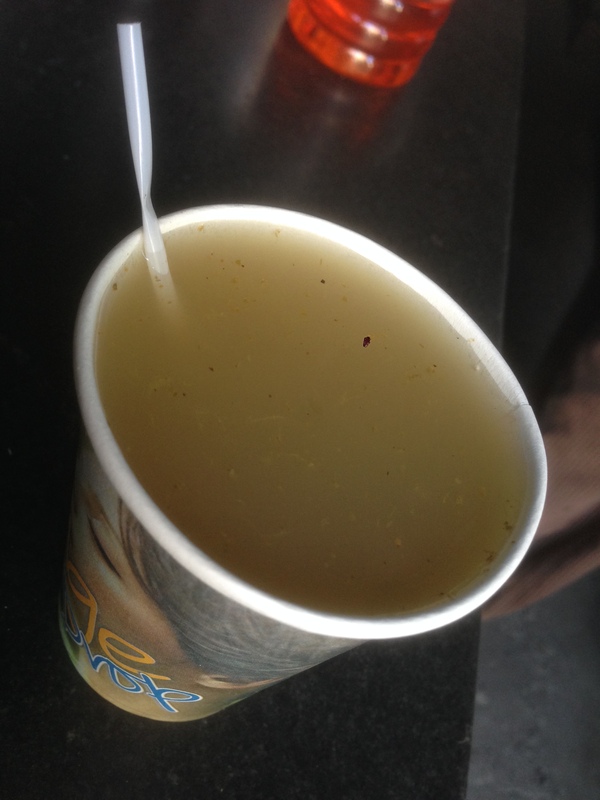 The sharbat was being mixed on a slab of ice kept in the base of a bucket (aluminium balti) so that one does not need to add ice to the drink but the drink still remains cold. It was a medium density drink, had lots of froth on the top made manually by churning. It was perfect sweet, not too much, not too less. 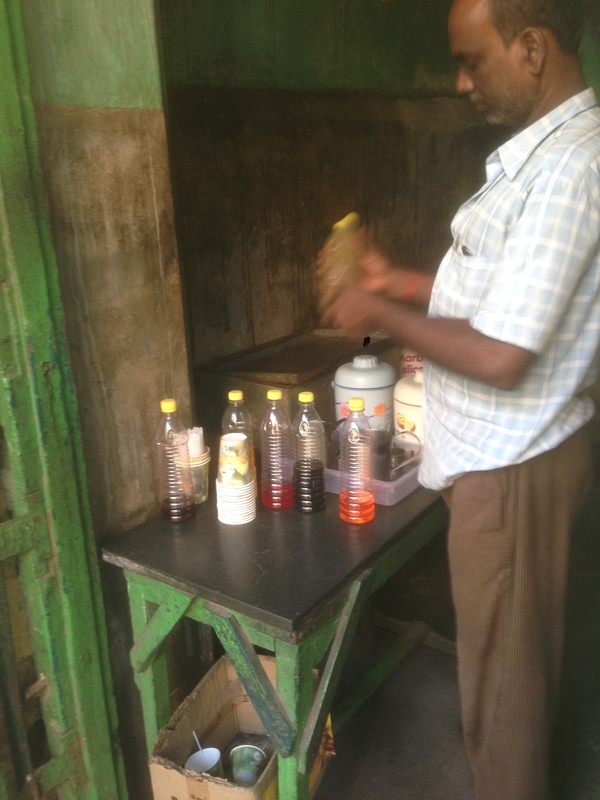 The guy was adding sme essence & syrups from small glass bottles & those he said were his secret ingredients. 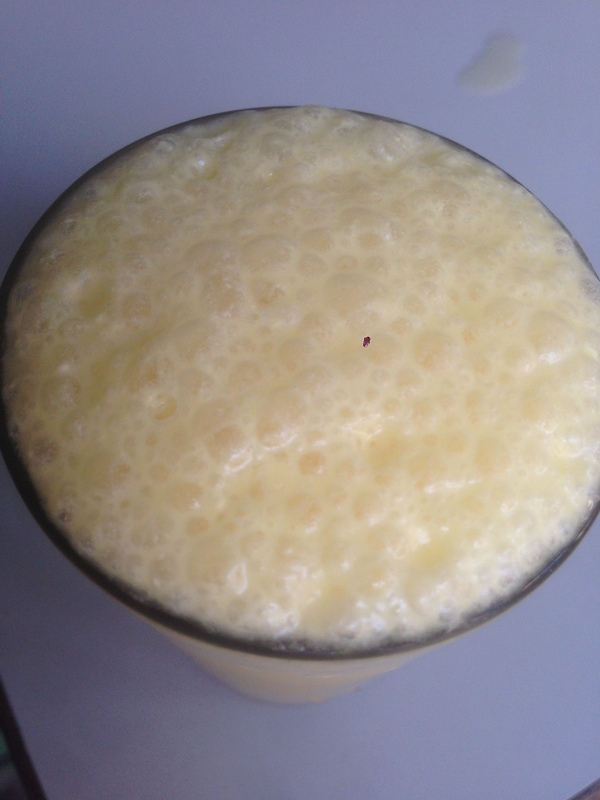 People from UP , delhi and in general Cow belt will find this drink thin. For kolkata standards this is good. 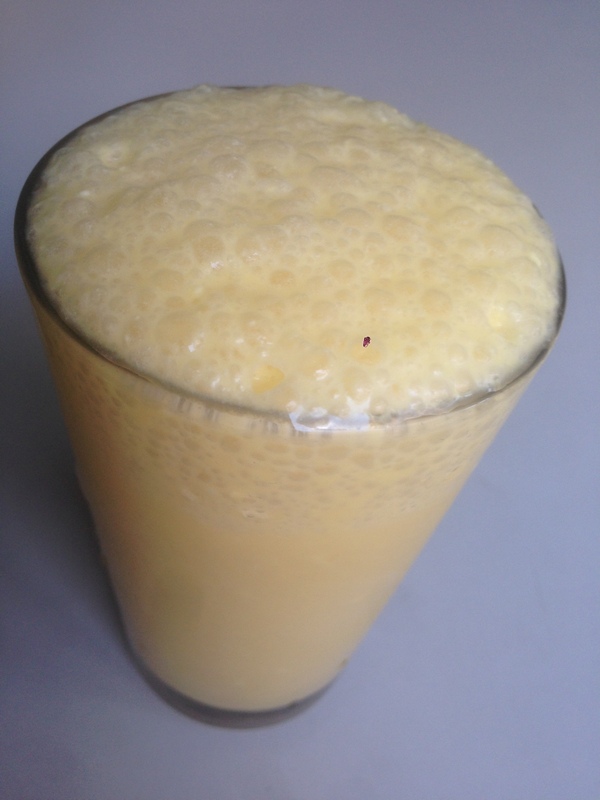 With no baggage / comparison with milk products in the Cow belt, this sharbat was good to taste as it is. Rate it 3/5. Abar khai was the second drink we had – It was curd based again but this time with different flavors (quite unique also). Loved it again & rate it 3.5/5. Overall rating of beverages at Kapila Ashram averages out to 3.5/5. I wud not go there from 30 km away but if I am around, I wud surely drop in.